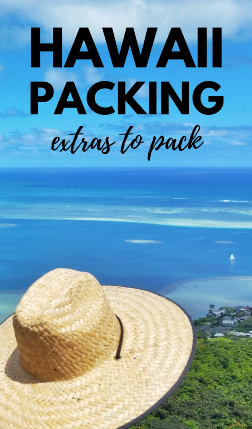 Because here, you’ll find some ideas that aren’t clothes that you may or may not want to bring to Hawaii! But, this isn’t just any packing list for Hawaii. What NOT to wear! This sunscreen will be ILLEGAL to buy in Hawaii soon. And there’s a good reason for you to leave it OFF your Hawaii packing list! Also, you really need to wear this in Hawaii – okay – might want to highly consider – because Hawaii’s sun rays are strong! They are shirts with UV protection for when you’re in the water. You’ll see lots of tourists wearing them in Hawaii, because those rays are stronger than you’re used to! And they minimize the amount of sunscreen you need to lather on. For women, swimsuits like these and tropical cover-ups like these. And for plus-size women, see here. Now to the list of what to pack for Hawaii! So… What are some things to pack for Hawaii? Do people still buy guidebooks when you can find everything online for free?! Especially when it comes to Hawaii, these books are pretty much the most popular ones out there! 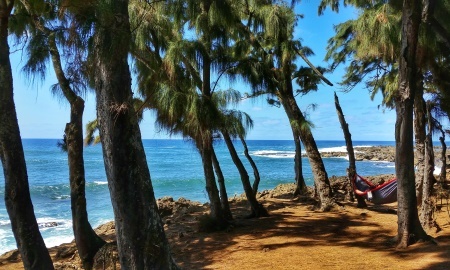 It’s a good way to find some of the more hidden spots, or lesser known areas, in Hawaii. There is a separate guidebook for each individual Hawaiian island of Oahu, Maui, Kauai, and the Big Island. For help in deciding which island to choose, here are some guides to help figure out which Hawaiian islands to visit. Or another quality aloha choice would be this sunscreen that Hawaiian lifeguards trust. 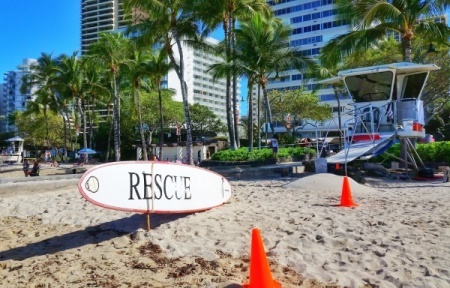 How much do Hawaiian lifeguards trust that sunscreen?! Now, to shield you further from the sun’s rays (that are likely much stronger than where you’re coming from, especially if your Hawaii vacation is in winter! 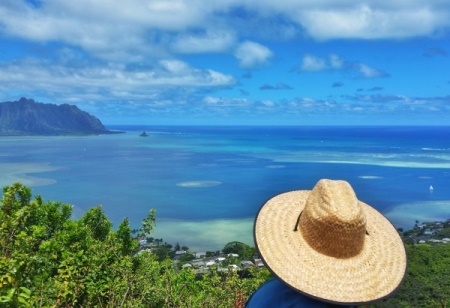 ), consider adding a sun hat to your Hawaii packing list. 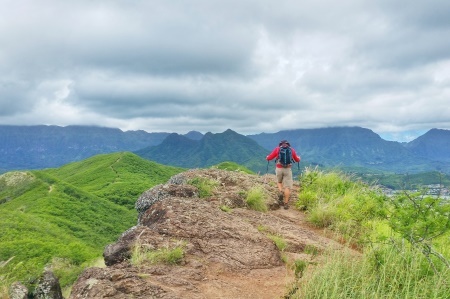 Especially if you’ll be hiking on sun-exposed hiking trails like at the summit of a hike in Kaneohe, one of the best short hikes on Oahu! A baseball cap is definitely better than no hat at all, but you may also further consider getting a hat that fully covers your ears and neck so you don’t have to be concerned about burning in these highly exposed areas. If you won’t be wearing a hat with this kind of coverage, be sure to apply sunscreen on these areas too. For women, have a look at these best selling sun hats. And for men, have a look at these best selling sun hats! Are you going to Hawaii with kids? He’ll get solid protection from Hawaii’s strong sun rays when he’s splashing in the water and look stylish doing it! 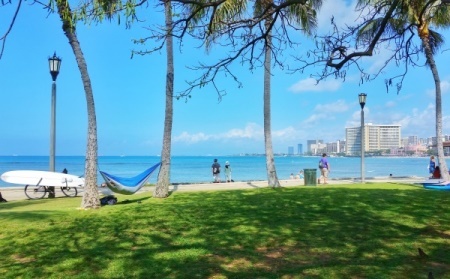 How about spending a day at Sans Souci park right near Kapiolani Park laying in your hammock right by the ocean? This area pictured above is just north of Three Tables Beach, which is south of Sharks Cove. Depending on the weight limit of the hammock, you can possibly have two people in a single hammock. Some hammocks sell the suspension straps separately, so be sure you read carefully to have all the pieces and to be able to set up safely. 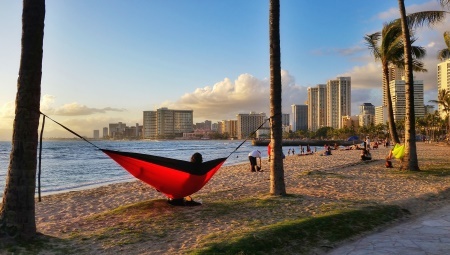 Also, before you pack your hammock in your suitcase, it would be a good idea to test the hammock out at your local park before you fly off to Hawaii. That way you’ll be a pro at setting up the hammock and you don’t need to stress about figuring it out when you’re in vacation mode! This is one of the best hammock brands out there. Lightweight, portable, and friendly to pack in your suitcase! It looks like she’s trying to maintain her balance. She went from walking along the beach to walking on the pier. She needs to watch her step because she’s barefoot and the rocky pier isn’t completely friendly to the soles of your feet! Not to mention the pavement can get hot when it’s baking in the sun! 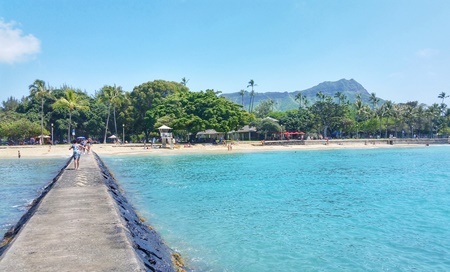 Okay, so if the pier isn’t that inviting to you, water shoes are also practical to put on your Hawaii packing list because the shoreline can be a bit rocky depending on what beach you’re at. This includes on the beach and in the water. Even if a beach or the water looks completely sandy, there could be hidden (sharp!) rocks. So these water shoes can be a good idea if you’re wading in the water! 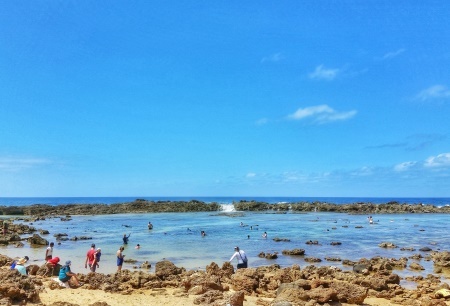 This popular North Shore beach, Sharks Cove, is a beach that you’ll want to watch your step carefully so you don’t step on sharp rocks! And they can also be useful if you are adventuring on a hike to find a military plane crash from the 1940s! Trekking poles aren’t just for advanced hikers or backpackers. 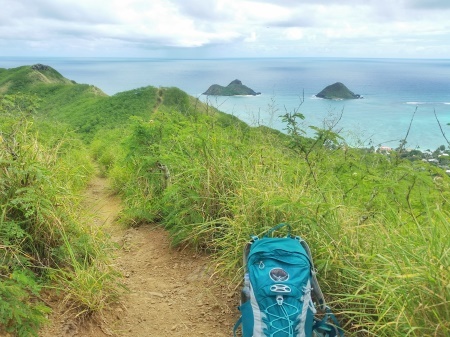 If you bring them for your Hawaii hikes, they can provide extra stability on the trail, and they can also help to save your knees when going down hill. By using trekking poles going downhill, you reduce the stress felt by your knees, providing a little bit of relief for your lower body. Get trekking poles that have a comfortable grip like these that are travel-friendly. They are light and collapsible, making them easy to pack for Hawaii. It’s probably best to pack trekking poles in your checked luggage so you don’t encounter any problems at the airport. Also, when you buy the poles, check that you are getting a pair and not just a single one. Well, if you’re headed for Hawaii, there’s a good chance you’re thinking about getting in the water. 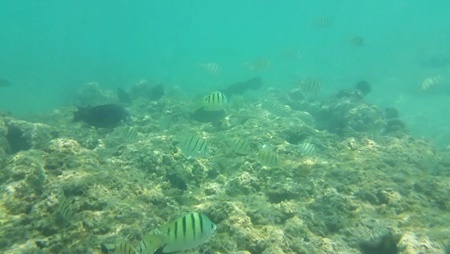 No matter what kind of camera you choose, an underwater action camera or your phone camera, be sure to add something to that Hawaii packing list that will let you take underwater pictures when you’re snorkeling! And if you’re not getting your snorkeling gear from places like the Hanauma Bay rental or Sharks Cove rental, you’ll want something like a beginner friendly full-face snorkeling mask like this or a more standard snorkeling set like this! And with all those consecutive days that you’ll be spending at the beach, you might want a way to be able to dry your wet items quickly! That’s when packing this type of ALOHA beach bag for your trip to Hawaii becomes useful. It lets the drying process get started from the moment you leave the beach because of the airy nature of it. You’ll still want to properly take out your wet items when you get back to your hotel room or airbnb, but in the meantime, you can start to air them out so they can be ready to go for the next beach day! Most beach umbrellas aren’t suitcase-friendly (too long), but the beach umbrella on the left looks like this one if you’re headed to the beach close to home! 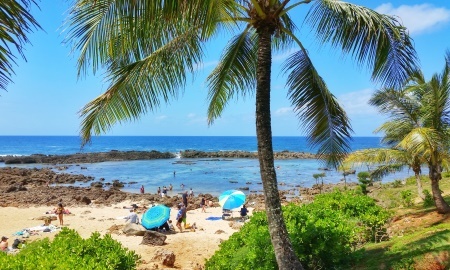 These two beach umbrellas pictured here are hanging out at Sharks Cove on the North Shore! You can also rent beach umbrellas near Sharks Cove too. But this size water bottle really tests the elasticity of the pocket, so it wouldn’t be recommended to make it a habit to carry your water like this. Instead, you can put the water bottle in the backpack itself, or this backpack is compatible with a hydration pack like this zip-up 2 liter water pack. Hiking with a hydration pack makes it so that you don’t have to go digging through your backpack each time you want to take a sip of water. Instead, the hose is pretty much right there at your chest, so all you do is grab what’s hanging out right in front of you and sip the water! This can be ideal for hiking in hot weather, because it can get you drinking water more often. The hydration pack fits into a specially designed back sleeve of the backpack and fits all the way in. This backpack has a bunch of different features that makes it perfect for a day hike. 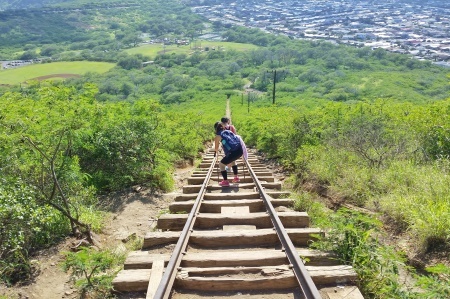 If hiking is on your checklist of things to do on Oahu, be sure to bring to Hawaii a good pair of hiking shoes or a pair of top hiking sandals! The final steps in getting ready for your flight to Hawaii: The actual packing! Now, here are a few items specific to your luggage that you may want to take a look at! If you’re packing for a family, save money on your luggage by getting your suitcases as a set. Get colorful colors so you’ll be able to spot your luggage easily at baggage claim! If you don’t want to have to dig through your entire suitcase to find what you’re looking for the night you land in Hawaii, you need these! Do you want this view on your flight to Hawaii? 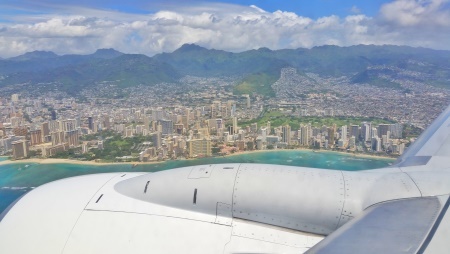 See flying to Honolulu Airport for where to sit on your Honolulu flight!